It’s one of those commercial days, which aren’t technically a holiday anywhere but are supposed to spread the feeling of joy and humor worldwide. Although nobody knows the scientifically eastablished story behind April Fools, it varies from barbaric revenge to humor to just another made up day as an excuse to get away with borderline hurtful pranks on your near and dear ones. Thankfully because of the digital age, you hopefully have very little to worry about pranks like buckets of water inclined on doors or other classic physical humor. The real jokes are on the internet, where all active establishments are celebrating the arbitrary day. By far, Google has taken the annual ritual of hilarious pranks on people on April 1st with a bizarre new product launch. The websites are designed so intricately and in typical Google’s style and design that the look very legit. If you happen to be absent minded and forget to not take any bizarre news occurrences today without a bit of skepticism, then they’re easy to fall for. 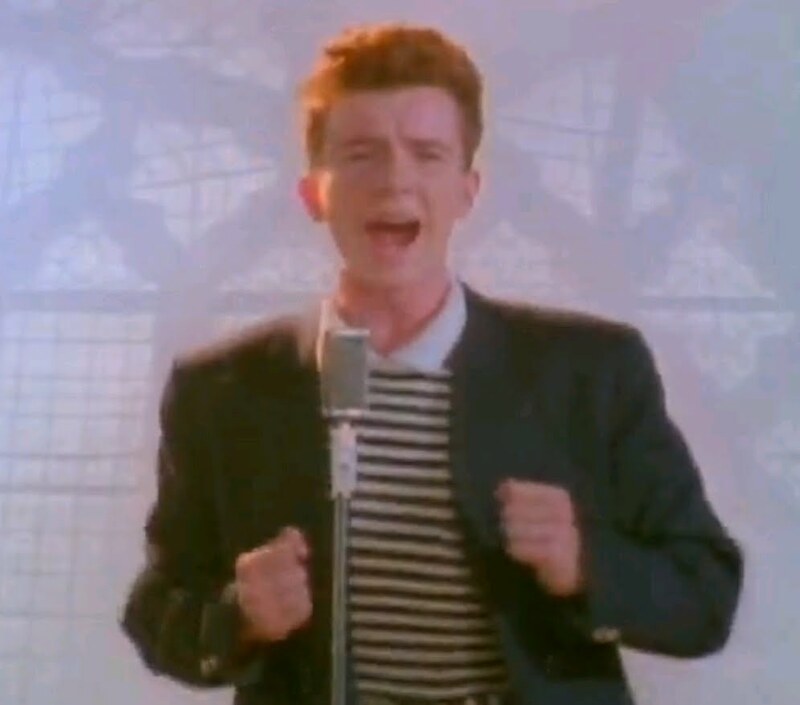 On April 1, 2008, YouTube participated on April Fools day for the first time by redirecting all featured videos on the UK and Australian homepages, and later, all international homepages, to a video of Rick Astley's song "Never Gonna Give You Up". This form of trolling is referred to Rickrolling, annoying the user and wasting their time with seemingly legitimate links. 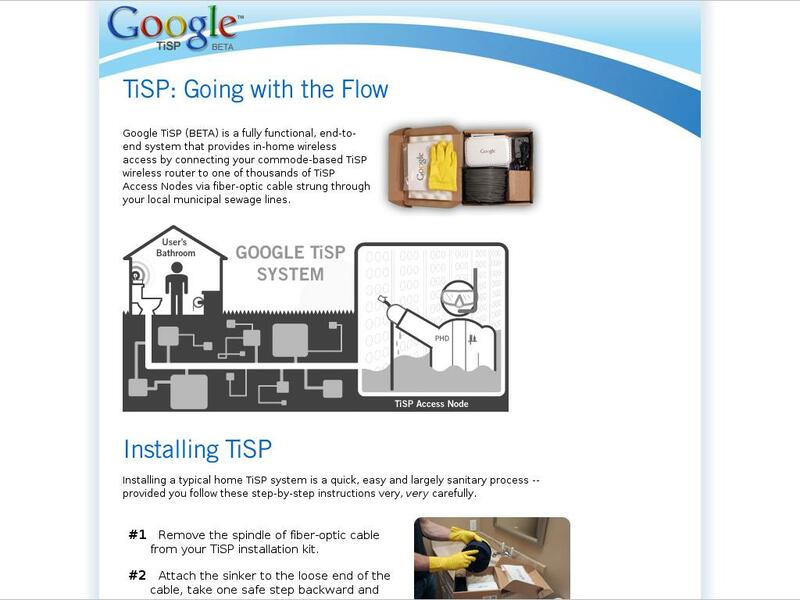 Google TiSP would make use of a standard toilet and already existing sewage lines in your home to provide free Internet connectivity at a high speed of 8 Mbit/s (2 Mbit/s upload) (or up to 32 Mbit/s with a paid plan)! The user would drop a weighted end of a long, Google-supplied fiber-optic cable in their toilet and flush it. Around 60 minutes later, the end would be recovered and connected to the Internet by a "Plumbing Hardware Dispatcher (PHD)". Google claimed that this was coordinated worldwide with cities and all plumbing lines worldwide! Alternatively, a user could request a professional installation, in which Google would deploy nanobots through the plumbing to complete the process. This scientific terminology simply implied that your bodily fluids would determine the ads you’d want to witness! This year’s prank has been a hilarious product called Google Plastic. Taking a jab at virtual reality sets, including possibly of the discontinued set Google Glass, Google Glass claims to offer “Beyond virtual reality. Actual reality. Technology that’s as powerful as you are. But not any more powerful than that.” The webpage is entirely designed in a way to sell the piece of plastic, which parodies the future of headsets. It’s literally a piece of plastic shaped like a headset without any technology or input/output at all. 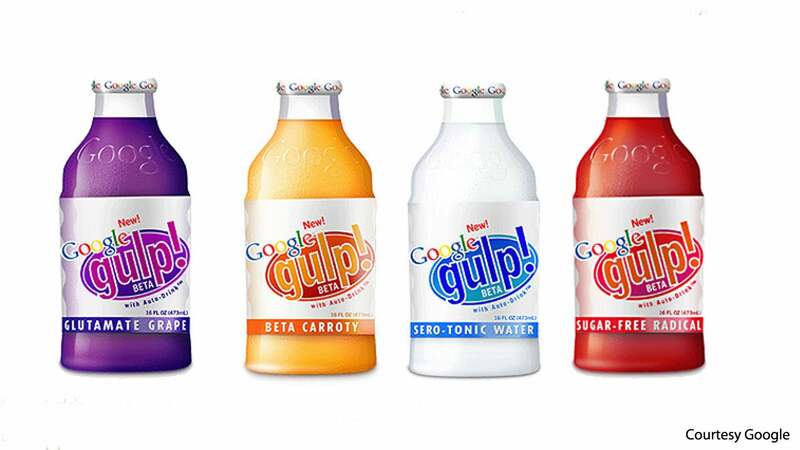 In 2005, Google launched a beverage drink that would “optimize one's use of the Google search engine by increasing the drinker's intelligence.” This would be achieved through real-time analysis of the user's DNA and carefully tailored adjustments to neurotransmitters in the brain (a patented technology termed Auto-Drink; as the "Google Gulp FAQ" suggests, partly through MAO inhibition). The drink was said to come in "4 great flavors": Glutamate Grape, Sugar-Free Radical , Beta Carroty , and Sero-Tonic Water. 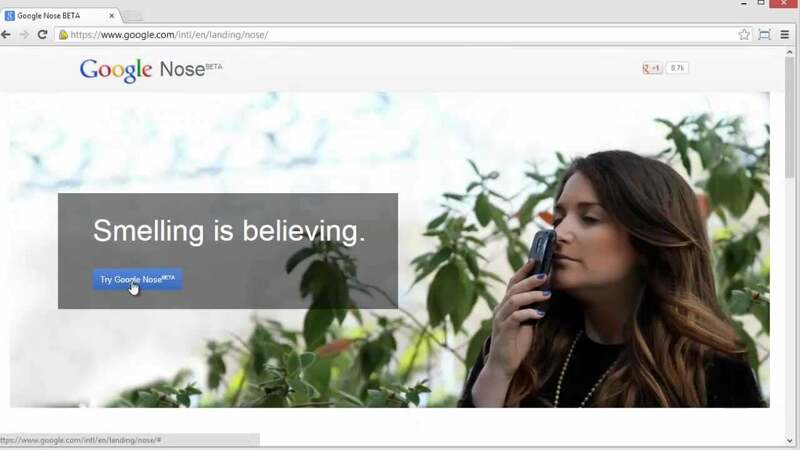 In 2013, Google announced Google Nose BETA for Chrome and Android, which as the name suggest enabled users to search on the basis of smells. The service supposedly allowed users to search for specific smells and scents across Google's search index. Google claimed to use an advanced algorithm to recreate the smell and deliver the scent through the user's computer or mobile device. Allegedly you’d smell the aroma Google appears to launch using your existing hardware itself!